One page primer on Windows 8 for Windows 7 users before looking at Windows 10 | 22 Point Blog! « Rooting Android and installing a custom ROM – Part 3 – My experience. I sat down this week to have a first look at Windows 10 and my intention today was to share my initial thoughts with you. Before doing that however, I realise that a lot of people (like me for the most part), heard the bad reviews of Windows 8, had a quick look and agreed, and have stuck with Windows 7. If that’s you, read on! If you’re an old hand at Windows 8, then jump straight on over to my first look at Windows 10. Firstly, please at least tell me you’re not still using XP! It’s no longer supported and that means any vulnerabilities found – and there have been several in recent months – will not be patched so even if you keep your anti virus up to date, you are still at risk. Before delving into my first look at Windows 10 I thought it prudent therefore to do a quick runthrough of some of the features from Windows 8. In case you’re wondering what happened to Windows 9 btw, Microsoft have jumped from Windows 8.1 to Windows 10 – either because it’s such a revolutionary jump in the future of Windows (if you listen to Microsoft) or to try and distance themselves further from the very badly received Windows 8 (if you listen to some of the analysts). 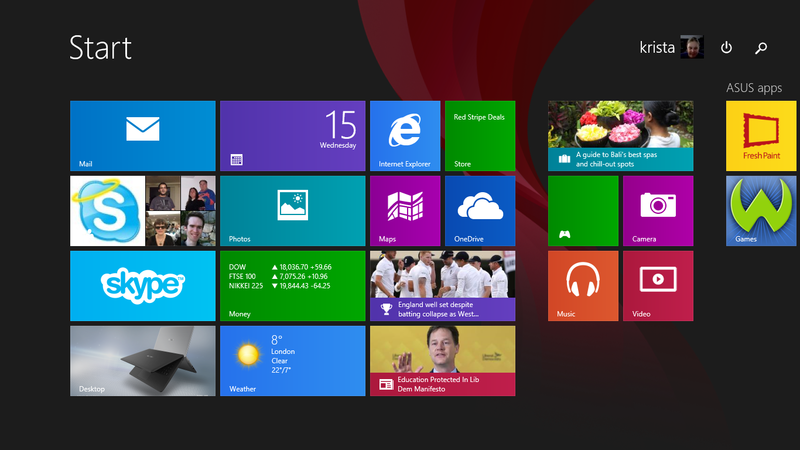 – Windows 8 ditched the start menu and introduced a start screen which was a patchwork of ’tiles’ to get you into programs. On the surface these appear larger than traditional desktop icons, however one thing which was very confusing was that when you moved the mouse to edges of the screen, things fly out at you that you either weren’t expecting, or invariably forget where to go for them without the traditional taskbar to “anchor” them to. Even more confusingly, when in a program, you were either in it full screen, or in a window with a desktop and task bar looking very reminiscent of Windows 7, but without the start menu. You could get the start menu back by downloading a 3rd party add-on from the Internet. – The Windows Magnifier works in full screen in all themes, including the High Contrast themes. In Windows 7 it only worked full screen in “Aero” modes, meaning if you preferred the better contrast of classic or high contrast themes but also wanted a full screen magnifier, you needed to use a 3rd party program. – Windows Narrator has been greatly enhanced. Instead of the half a dozen options and commands, there are now a half a dozen screens full of options including an extensive command list, meaning you can perform a lot more of the tasks that you would have otherwise used a fully fledged screen reader like NVDA or JAWS for previously. (Most users I know still preferred to stick with their chosen screen reader though). – Your Microsoft ID is a lot more intrinsically linked with Windows now. Where previously you might have used it for Hotmail / Outlook mail, or Skype, now you also use it to log in to Windows and it then automatically logs you in to those other services. So that’s your one page primer on Windows 8, let’s move on and have a look at Windows 10! This Post was tagged accessibility, low vision, windows 10, windows 8. Bookmark the permalink. Of course, I had XP for about ten years, and I’ve had 8 for only a few months, so a lot of it might simply be that I’ve not acclimatised to it yet. Nor will I, at this rate! as far as I’m concerned, XP weren’t broke. – Download the latest drivers for your video card, and monitor if available. Make sure you get them from the manufacturer site (eg http://www.nvidia.com/drivers if you have Nvidia graphics NOT some ultimate driver site that will probably install all kinds of other things). – Tweak the DPI. In control panel / display you can “change the size of all items”. This lets you go up to 150% of normal, but if you select “custom sizing options” you can scale up to 500%. That will certainly get you bigger but causes problems with lots of programs. I find somewhere about 175 – 200 % often works well without causing too many problems but it really depends on your computer and the programs you run. – Windows 8 (and 7) come with a much better magnifier built in than Windows XP – if you press WINDOWS+PLUS you can magnify everything (note that it doesn’t show everything on screen at once but rather follows the mouse). If you go into the magnifier window which appears and into the settings “cog” you can also set it to follow the keyboard as well. I would definitely stick with 8 (or upgrade to 10) rather than trying to go back to XP as Windows XP is no longer supported and quite insecure and easy for malicious software to get onto now, even if you are running the latest version of your anti virus. I hope that helps a bit, do let me know please!